Today, we’re going to talk about automation. In fact, in a recent McKinsey study, they talk about global automation increasing productivity eight-tenths to 1.4 percent. The economic impact of that will be huge. Now, they also talk about the impact on businesses through automation; and, they talk about the industries that are most likely to be automated. And, the No. 1 industry is the restaurant industry, food service, at a whopping 73 percent potential. What’s lacking is any strategy, and hope is not a strategy. You see, at SYNQ3, we have a strategy. Folks tell me: well automation is going to reduce the labor force by 30 percent. That’s nonsense. We delegate to technology that which technology is best at, and we elevate people into roles that are more suitable just for them. We sell more food. We raise checks. We make more sales and more profits. That’s an effective strategy for automation. Automation is where we’re headed globally. You can see automation trends throughout all industries from the development and use of AI devices like Amazon’s Echo to the deployment of ordering kiosks in restaurants. The shift toward automation is changing and will continue to change the way businesses operate and how consumers interact with businesses. 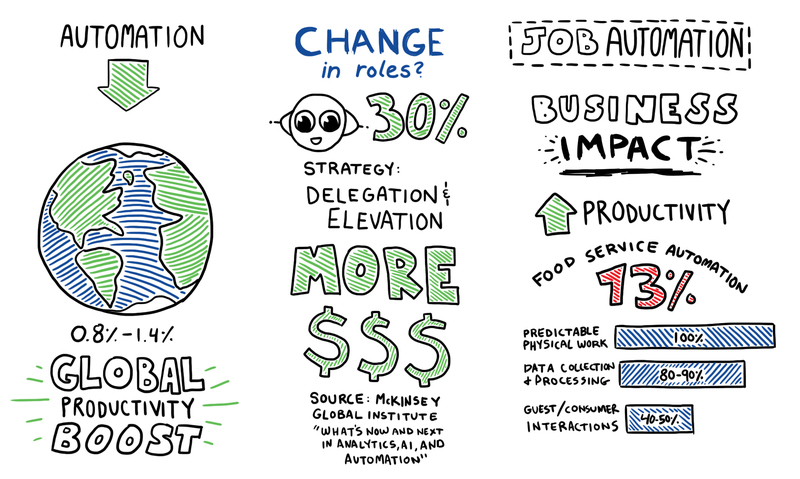 According to a recent McKinsey Global Institute study, the move toward automation has the potential to significantly boost productivity and economic well-being across the globe. The study states that automation could boost global productivity by margins of 0.8% to 1.4% annually benefiting national and global economies and most business sectors. The study also details the potential for automation within various sectors broken down by the activities associated with the industries. Some business sectors have a greater potential for automation than others. So, what does this mean for the restaurant industry? With at least 30% of activities in most occupations being automatable, according to the study, there will need to be a shift in roles. It’s not an issue of job loss; it’s the opportunity for job elevation and rearrangement. Growing productivity and a growing economy will require more jobs in other sectors and in other roles. At SYNQ3, the strategy for handling this phenomenon is to delegate to technology that which technology is best at and elevate people into roles that are more suitable just for them.